Back in Sidcup after the War, Tom resumed his family life, as well as his job for the Admiralty at Woolwich Arsenal. He had returned to Civvy Street for good. Around this time, Tom’s first son, Charles Frederick, who was still living in South Queensferry, where he was better known as Derry, met and married an Irish girl called Helena Mary Lane, who was usually referred to as Mary. In the summer of 1949, Derry and Mary, along with their baby daughter, Ann Marie, visited Tom and his family. 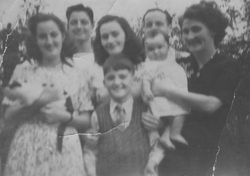 This photograph, taken by Derry at the time of the visit, shows Anthony and Tom at the back; Pamela, Mary and Gwen with Ann Marie in the middle; and young Mike at the front. As far as we are aware, the photograph records the only time Tom and all four of his children were together in the one place. Apart from a brief visit to South Queensferry by Pamela and her first husband, George Thompson, in 1956, there also appears to have been no further contact between Tom and his family in England and Derry and his family in Scotland; they all simply seem to have lost touch with each other. In 1954, more than twenty years after their relationship began, Tom and Gwen were married in Sidcup. This photograph is thought to have been taken on the day of their wedding. We don’t know why they waited so long to marry, although we suspect that Tom was not able to obtain a divorce from his first wife, Annie, until then. Some time after the marriage, the family moved from Sidcup, first to Welling and then to Bexleyheath; in both cases, these were London suburbs that would bring Tom closer to his work in Woolwich. On Tom’s retirement in the 1960’s, he and Gwen moved again, this time to Scunthorpe in Lincolnshire so that they could be closer to Gwen’s mother, who lived in Lincoln and was very ill. It was in Scunthorpe that they owned and ran a corner shop, perhaps reigniting in Tom memories from long ago of the fruiterers and greengrocers run by Charlie and Amy from their home back in Margate. It was in Scunthorpe, too, that Tom and Gwen lived with a widowed friend of Gwen’s by the name of Vera Millar. But it would not be long before the three of them would leave Scunthorpe and head north.